The community of Ampilatwatja have made a conscious decision not to paint their traditional Dreaming stories, but instead paint their country where those stories take place. 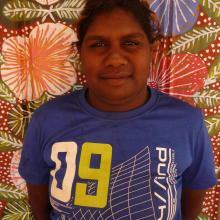 The Artists of Ampilatwatja community was established in 1999 near Alice Springs in the Northern Territory. The work produced by the artists is recognisably distinct from other Aboriginal artistic communities, due to the application of fine dots and the often bright and naive figurative depiction of the land.